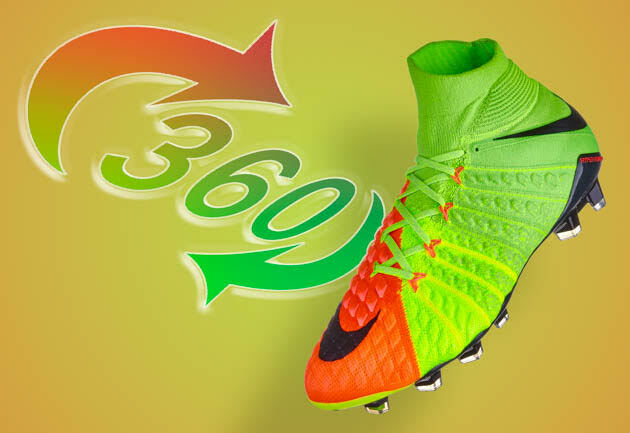 Update: This page has been updated to reflect the changes on the third generation of the Nike Hypervenom. It’s only been around a few years, but the Nike Hypervenom has made quite a name for itself in its short life. What’s more, the Phantom, Phatal, and Phelon are already on their third version. But what separates all these boots? We go through the subtle differences in our tier rundown of the new Nike Hypervenom III. Click for a 360 view! Let’s start off with the top dog. Once you start reading about the updates to the Nike Hypervenom Phantom from the second to third generation, you start to realize they didn’t just make a couple of minor changes and call it a new update. Nike have made noticeable aesthetic and construction alterations that make the Phantom III a different experience from the (let’s be honest) slightly disappointing Phantom II. 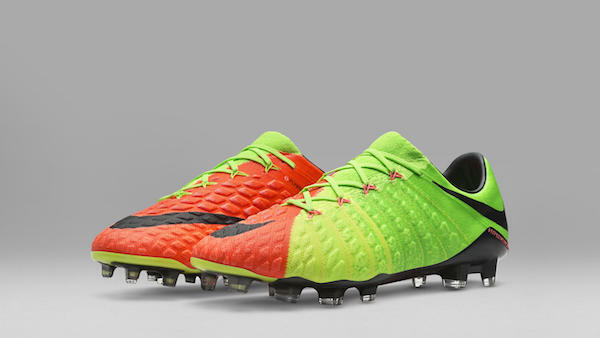 Nike are now offering the Hypervenom Phantom III in both high-cut and low-cut versions. So the highest price point Hypervenom is the Phantom III with the Dynamic Fit collar. 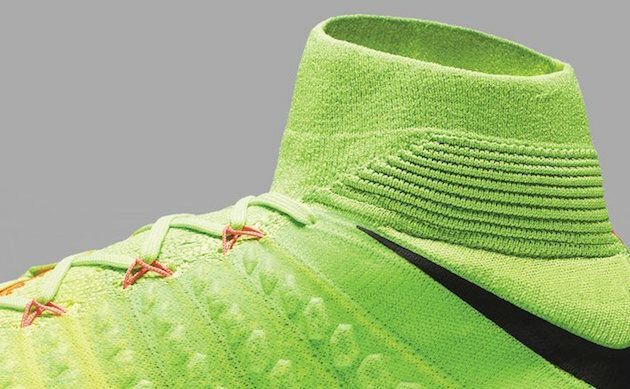 You may have noticed the collar looks a tad different than the one on the Magista Obra or Mercurial Superfly. This is because Nike are using an asymmetrical Dynamic Fit collar that they have dubbed their Agility Cuff. The collar fits over the ankle for a glove-like fit that makes the foot, ankle and lower leg work as one single unit. Another significant change is that this is the first time the Hypervenom has a full Flyknit upper, as opposed to the synthetic/knit combination of the previous versions. This ties in with the Flywire integrated into the upper of the boot. With the collar locking the foot down, the strategically placed Flywire then ensures your foot does not slide within the boot. The Flywire has a second purpose of creating a better touch on the areas of the boot that are likely to have more action with the ball (which is why it is more heavily concentrated towards the toe). Another addition to the upper is the HyperReact Strike Zone. These are PORON® Foam pods in the strike zone that provide higher energy return to optimize shot velocity. It’s the little things that make the Hypervenom Phantom worth it. The Phantom III DF’s upper also features the now customary All Conditions Control (ACC) and a tongueless construction. 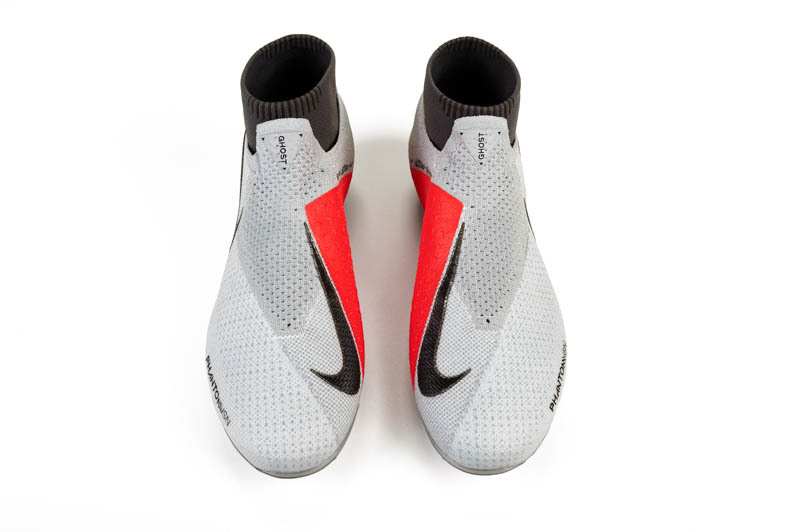 The result is an upper that allows the user to have a good, close control of the ball, but it still has a little more padding than the Mercurial Superfly. More major changes take place on the soleplate, which Nike are calling the HyperReact Plate. 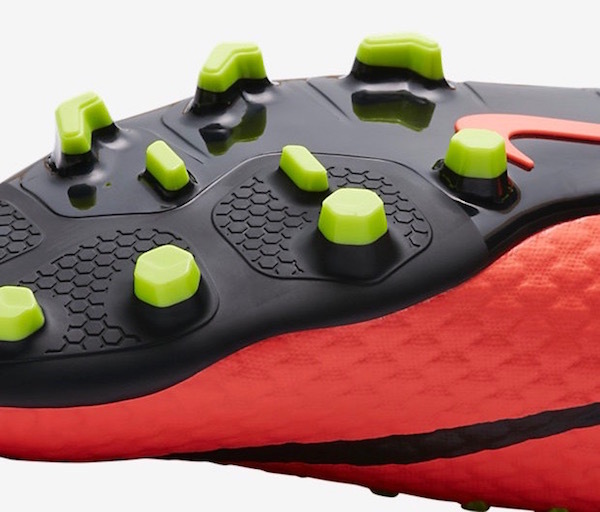 Since the Hypervenom’s identity is in agile cuts and deadly finishing, they have designed the soleplate to be an ideal companion for that type of player. It’s thinner in the forefoot, which allows for more flexibility and quicker movements. In the heel and midfoot it’s stiffer for a more stable feel. 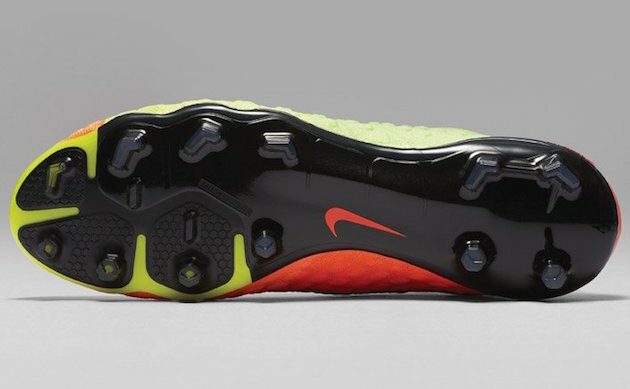 Nike have also mixed up the stud shapes on the forefoot. The lateral side (outside of your foot) now has chevron-shaped studs to provide better acceleration, braking, and lateral cuts. 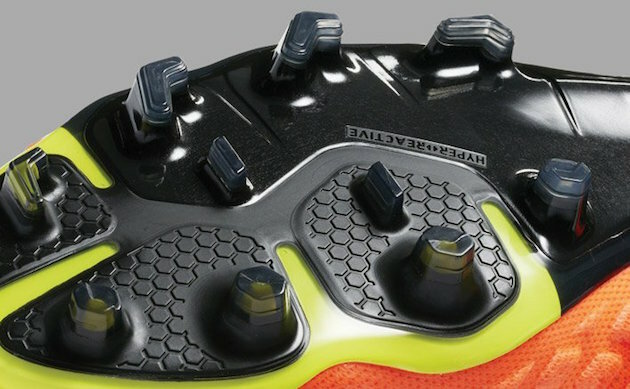 The medial side (inside of your foot) now has hexagonal studs for more rotational traction. Nike thinks this combo of stud shapes will work together to give you the full package, as opposed to the all round forefoot studs on the previous Phantom. 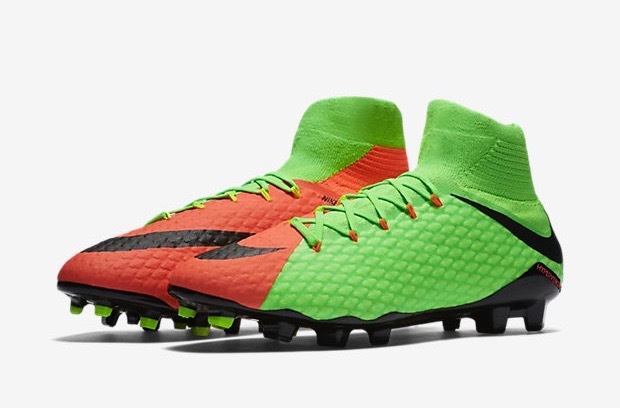 Just like the Magista Obra and Mercurial Superfly, the Hypervenom Phantom Dynamic Fit version can be found at a $300 retail price. 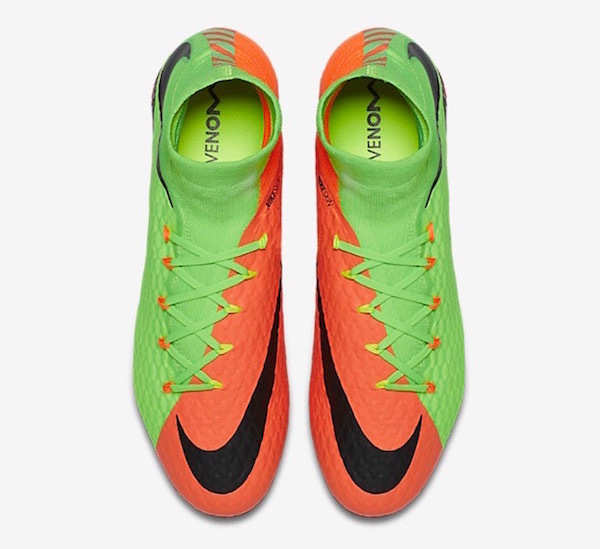 Of course, if you can live without the Dynamic Fit collar, you should check out the Nike Hypervenom Phantom III for a more affordable high-end boot. That’s right, the non-DF Phantom III has all of the same innovative construction and design touches of the Phantom III DF, just without the benefits of the high-top. 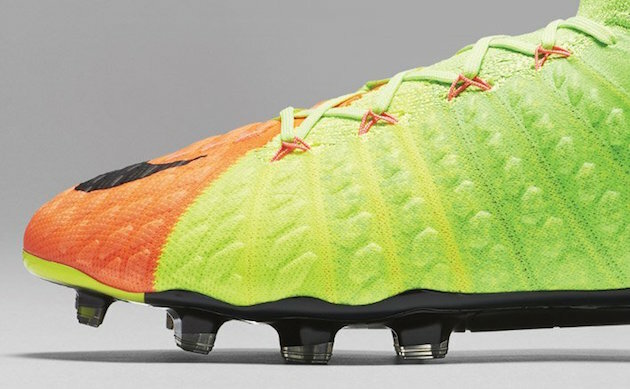 This has essentially replaced the Hypervenom Phinish. So long Phinish, we hardly knew thee. 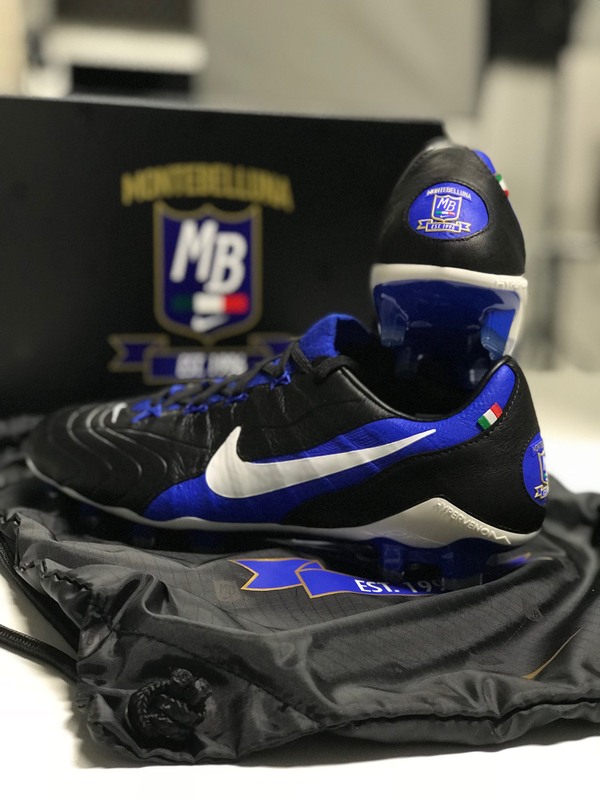 Some professionals have ditched the collar (or manually chopped it down) for the low-cut version, so now Nike have made it possible for customers to buy a state-of-the-art Nike boot at a lower price. Other than the Dynamic Fit, you’re looking at the same upper, replete with a full Flyknit construction, Flywire, ACC treatment, and the HyperReact Strike Zone. On the outsole, it’s the exact same HyperReact Plate that has been created for the Hypervenom Phantom’s third generation. You’re also getting the non-DF Phantom III for $70 less, at $230. 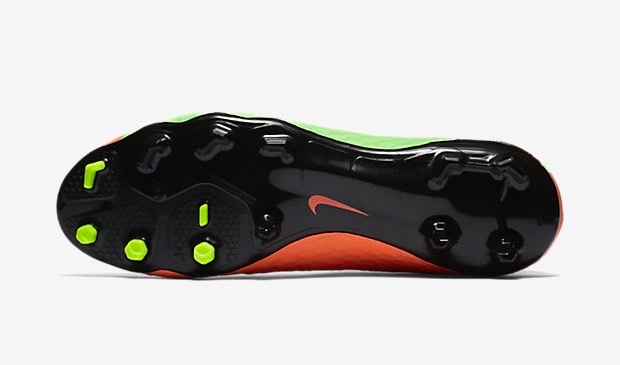 Aaaand the Dynamic Fit collar is back, this time on a mid-tier boot. Well, it is kind of a mid-tier boot. 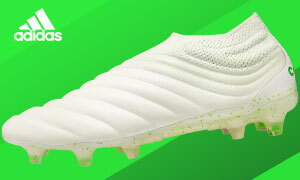 Priced at $170 retail, the Nike Hypervenom Phatal III is pretty pricey for a mid-tier boot (there are some top-tier boots that cost the same as the Phatal), but the addition of the collar makes the Phatal an attractive option. However, this collar is made from a thicker material than the Flyknit collar of the Phantom III, even if you still get that sock-like feel. Slipping into the Phatal will not feel quite the same as putting on the Phantom. Although it still has Flywire and a tongueless construction, there are no foam pads like on the Phantom to assist with your strike and no ACC treatment for better defying inclement weather. The Hypervenom Phatal does utilize Nikeskin for a multi-layer construction of synthetic and mesh for a close touch on the ball. Moving to the soleplate, Nike have not blessed the Phatal III with the HyperReact Plate. While the stud shapes and placement remain similar, the materials and construction is different. You will not find the same flexibility in the Phatal’s soleplate, nor does it look as flashy. Although it will look the same in color and profile to the Phantom, the Nike Hypervenom Phelon III doesn’t have much else in common. Gone is the Flyknit, Flywire, ACC, and tongueless construction of the other boots. So what does the Phelon III bring to the table? Well, first of all, at a $90 retail price, it is exceedingly affordable. Secondly, there’s still plenty to like here. Nikeskin adorns the upper, so you can enjoy the lightweight comforts of that material. 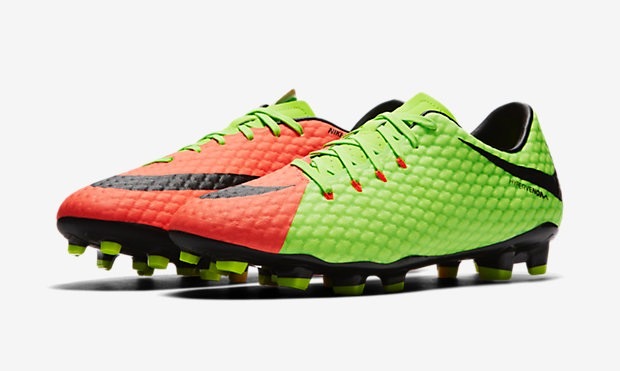 Plus, the upper still has the asymmetrical lacing of the other Hypervenom boots. The main difference between the upper of the Phatal DF and Phelon is that there is no Dynamic Fit collar or Flywire technology on the Phelon III. The soleplate is a plastic plate that gives you support and a responsive feel, although it will look a bit different in color from the Phatal’s soleplate. 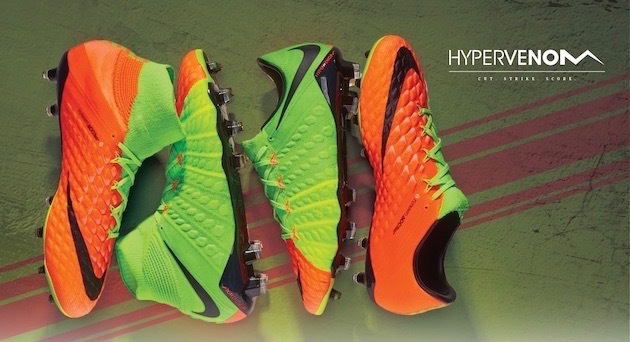 Alright, so now that you know the differences, which Nike Hypervenom are you going with? Hit us up in the comments. My son loves these shoes! He loves the style and wears them every day. Your son… wears football boots… as normal shoes?